PHOTO BY MARK CHAMBERLIN Inspired by the quick service taquerias he found in San Francisco, Dave Jackson recently opened Bay Vista Taqueria on Bay Road. The menu servies a variety of tacos - like the Baja fish and beef tacos seen here - as well as burritos, quesadillas, and salads. Dave Jackson comes in to Bay Vista Taqueria (1205 Bay Road) at 7 a.m. each day to start prepping. The ins and outs of running a kitchen are considerably different than what Jackson had been doing for the past 12 years: operating his own web development business — although Jackson worked in the restaurant industry for years prior. He and his wife, Jennifer, were not looking to open a restaurant, but when the Bay Road property that used to house Gyromania became available, they thought they would check it out. Bay Vista opened on June 1. Inspired by the quick service taquerias found in San Francisco, Jackson wanted to open a place where you pop in, get some tacos made with fresh ingredients, and go on your merry way. The menu grew to include more than just tacos, and now has burritos, quesadillas, and salads. All the tacos are made with soft, corn tortillas, although flour tortillas are available upon request. The recipes are carefully researched and tested out in the Jackson home kitchen. "The key to our cuisine is freshness and making sure everything is seasoned properly," Jackson says. "There is definitely a California influence." 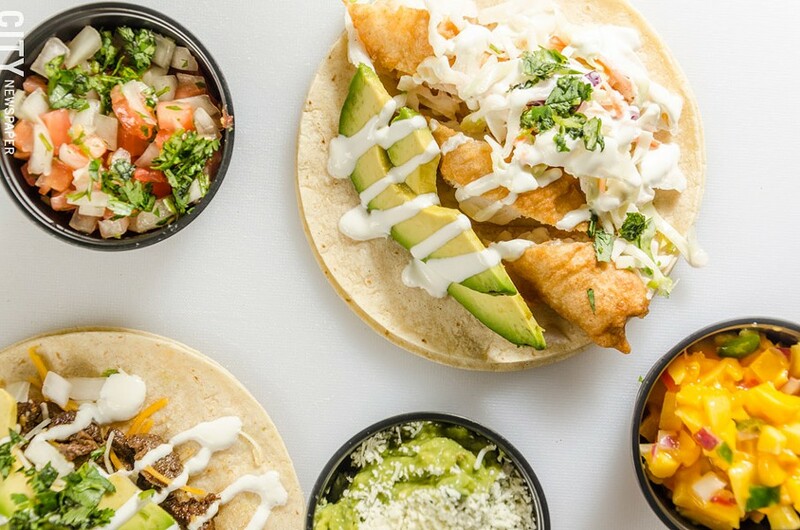 The house special tacos include a Baja fish taco ($4 each) that features battered and fried cod, sweet cabbage coleslaw, lime-crema, and sliced avocado. The Hawaiian fish taco ($4.50 each) incorporates coriander- and chile-rubbed Mahi Mahi that is then grilled and topped with mango salsa and lime-crema. The burritos (from $7.75 to $9.25) are stuffed with your choice of meat, vegetable, or fish, and then seared on one side. "The response we have gotten from the community has been overwhelming," Jackson says. He grew up in Penfield, and he, his wife, and two daughters live in Webster. "Sometimes when something you're not looking for comes to you, you just have to go with it." Bay Vista Taqueria is located at 1205 Bay Road, and is open Monday through Thursday, 11 a.m. to 9 p.m., and Friday and Saturday, 11 a.m. to 10 p.m. 671-8226. Find them online at bayvistaeats.com. Sunday brunchers, rejoice! The "Brunch Bill" passed legislation and allows for restaurants, bars, taverns, and special event and sporting venues across the state to start serving the hard stuff at 10 a.m. on Sundays. The bill also aims to support local wineries, distilleries, breweries, and cideries by reducing fees and regulations. The Genesee Brew House has opened a beer garden at Sahlen's Stadium (460 Oak Street). The beer garden will feature new craft beer from Genesee's Pilot Brewery in addition to old standbys from Genesee's roster of beers. The George Eastman Museum has released "The Photographers Cookbook." The idea and research for the book — which features both work by photographers and their favorite recipes — originally transpired in the 1970's, but when the editor left the museum, the book died with her departure. The project was revived by the current curator in charge, Lisa Hostetler, and serves as a time capsule of photos and favorite recipes from the 70's. The book can be purchased for $29.95 at eastman.org or at the George Eastman Museum (900 East Avenue). Fuego Coffee has said goodbye to its original location at 167 Liberty Pole Way, and has moved to 45 Euclid Street. With a kitchen in the back, it's now able to serve light dishes like wraps and sandwiches. Thai Mii Up (Yes, it is a restaurant) has opened at 1780 East Ridge Road. Qdoba, a fast-casual Mexican chain, has opened a location at 1867 Empire Boulevard, and there is another one planned for a late-summer opening at 255 Westfall Road. Great Northern Pizza Kitchen has closed its final location — in the Bruegger's Bagels in College Town (1400 Mount Hope Avenue).